Puppy Biting: Fix it Fast! Nipping, mouthing, puppy biting, we have all kinds of cute definitions and ways of explaining away the problem of puppies putting their teeth on us, but the truth is it isn’t cute. Some people will say puppy mouthing is different than nipping and nipping is different than biting and while I understand and agree with most of what they are saying the problem is that puppy teeth are going on human skin or clothing! This is one of those puppy complications that most people face at some point and the biggest problem is that people don’t realize puppy biting is a problem until it becomes so frequent that they can get nothing done, OR it really starts to hurt! Puppies have some of the sharpest little teeth on the planet! I HATE puppy teeth! And, when wielded insistently it not only hurts but it can also leave you with a bloody body part! A friend’s Springer Spaniel puppy once used his razor sharp puppy teeth to rip an earring out of my toddler daughters’ ear when we came over to meet him for the first time. A puppy biting kids is SO NOT COOL and the bloody mess was very traumatic for my little girl! By far the best plan of action for surviving the puppy nipping or biting phase involves being well-prepared. 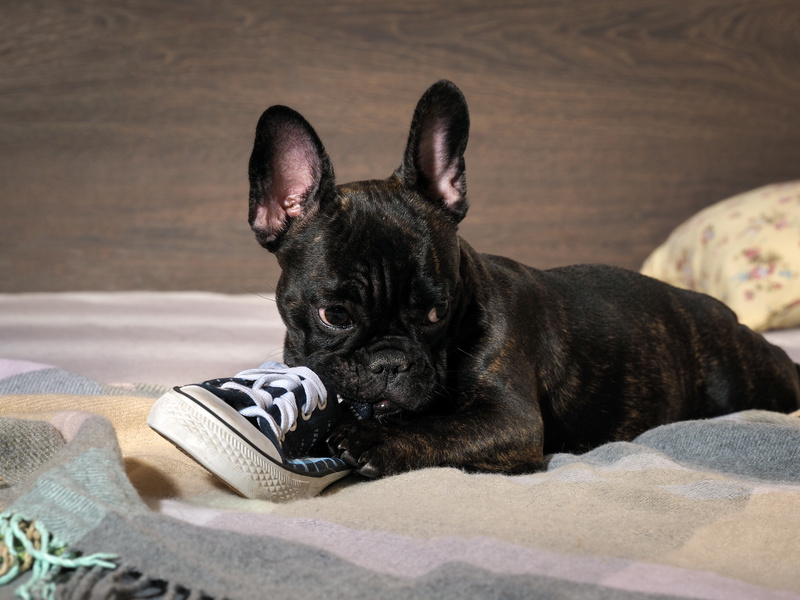 Manage your puppy’s environment by storing anything you don’t want him to chew on, including plants, wires, and anything else within his reach. Get on your hands and knees and crawl around. Be sure to remove or puppy proof everything at ground level. Have lots and lots of appropriate objects available for teaching your puppy to wrap his teeth around, and remember to praise him every time he puts the right item in his mouth. Be patient; this too shall pass! 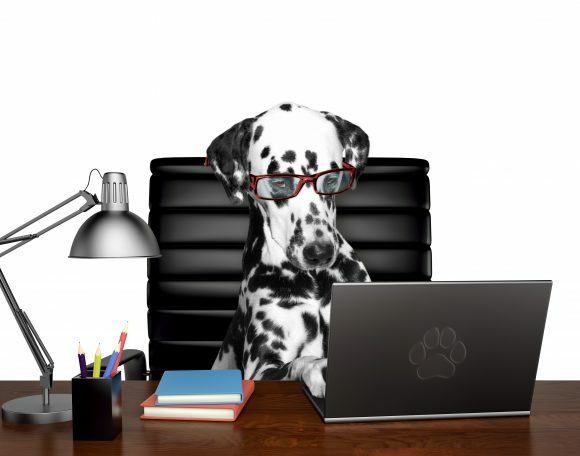 I believe that in order to really make a difference with your dog and dog training we must understand why this behavior happens; then we can make sure we are fulfilling our dog’s needs while making sure we are not inadvertently rewarding bad behaviors. 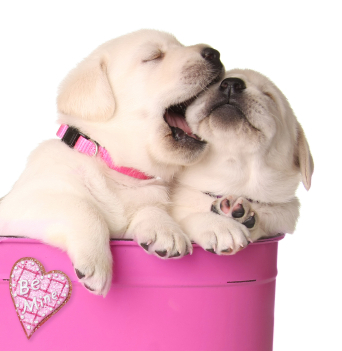 Like human babies, puppies explore their world by mouthing items they encounter. This means everything goes into their mouth, whether it’s appropriate or not. Puppies play with each other with their teeth. Dogs don’t have hands and opposable thumbs to hold or throw objects or play with toys. They aren’t able to use their hands to explore their environments. Puppies are born deaf and blind, they do not begin to hear or see until they are about 2 weeks old. They learn use their mouths, shortly after they are born, to explore their environment. As they grow they are constantly learning about their environment by nipping and mouthing. They bite their litter mates, they mouth on things in their environment, and they even bite their mother. 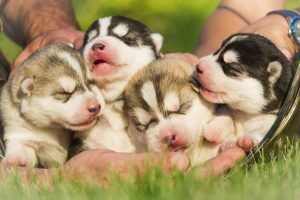 It is essential that puppies stay with their mother until at least 8 weeks of age so that she can begin to teach them about bite inhibition. When a pup bites mom too hard, mom is swift to bite back and teach the pup about the inappropriateness of rough play. Without mom’s help during this crucial period in a puppy’s life, they often don’t learn about bite inhibition and frequently develop into bullies. 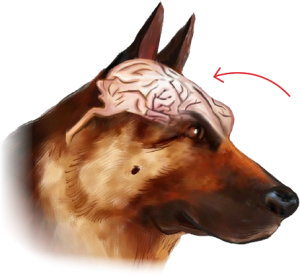 Read an article by well-known animal behavior expert Dr. Ed Bailey that explains the science behind this. 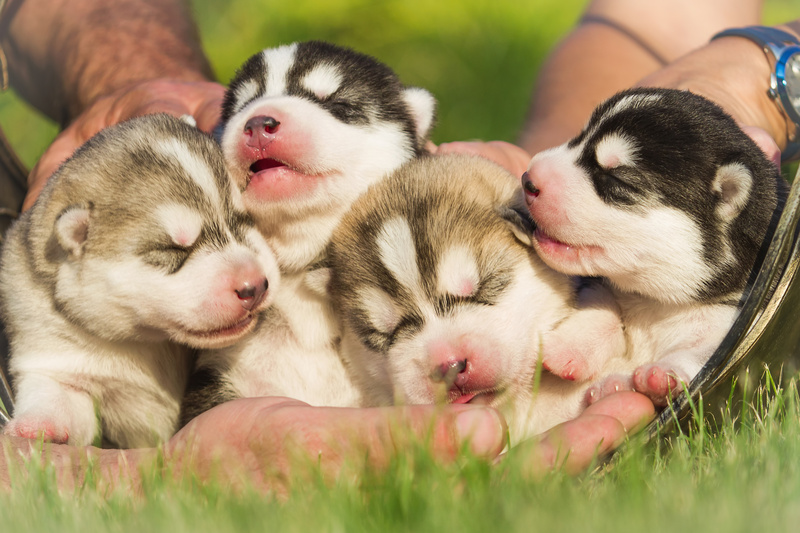 According to this research, puppies benefit from staying with their mother and litter mates until 10 weeks of age. During the period of 7-9 weeks, fears begin to develop. The worst time to take a puppy away from the security of its mother and the human family it has known is during this period. At 10 weeks the puppy is better able to adapt to new situations and not to develop fears of new sounds and situations. and growl at their litter mates and playmates? Often puppies play hard or soft depending on their playmate and how hard he/she is playing. I have seen dogs throw each other around by their necks, growling and body slamming each other but doing so only in play and never breaking skin. Dogs can only learn to play with other dogs by playing with other appropriate non-aggressive dogs. I think dog play is a crucial behavior for puppies to learn when they are young! Older dogs will teach them the appropriateness of how hard to bite, and young dogs can teach them how fun it is to play rough sometimes. Although it is normal for a puppy to explore its environment using its teeth and mouth, it is inappropriate for them to put their teeth on humans and they must be taught not to do this under any circumstances or for any reason, EVER! 95% of new puppy owners think this behavior is cute at first, and therefore they allow it to continue until it gets out of control to where the the puppy is biting hard or maybe even biting kids. Each puppy is different some puppies will innocently mouth for months and never escalate to a bloodletting but some puppies realize very early on that their human not only tolerates but likes this behavior and things quickly escalate to harder and harder bites. The most important thing is to not allow the behavior at all! A tooth on skin is never cute! Even if you don’t have children imagine how the same behavior would feel to a 2 year old child or a 95 year old senior with fragile skin; if it is not appropriate for this human dynamic it should not be appropriate for you! This behavior quickly escalates and it is crucial to nip it in the bud right away! Here’s a game we like to play with dog’s to teach them that how to play appropriately with us humans. This game teaches puppies that there are rules to playing with us, like you can’t bark everytime you want to play… and that if we let you play, play time stops if you bark, bite or jump on us in ways we don’t like. Its a great game for solving a lot of problems. I once had a puppy that would latch on to my thigh every time I moved quickly or ran (his prey drive was in overdrive), it didn’t take long for this to become a problem! Figure out what type or reward or payoff your puppy is getting out of mouthing, nipping, or biting. Is he trying to play with you? Is he irritated with you? Or is he just bored? the biting behavior is not rewarded! Teaching your puppy that his teeth don’t belong on human skin. Make sure that you initiate play with her several times a day. Substitute a toy or chew bone when your puppy tries to gnaw on fingers or toes. Encourage noncontact forms of play, such as fetch and tug-of-war, rather than wrestling and rough play with your hands. Once your puppy can play tug safely, keep tug toys in your pocket or have them easily accessible. Avoid waving your fingers or toes in your puppy’s face or slapping the sides of his face to entice him to play. Avoid jerking your hands or feet away from your puppy when he mouths. Slapping or hitting puppies for playful mouthing can cause them to bite harder. They usually react by playing more aggressively. My puppy was trying to play, so I made sure that each time he used his teeth it equaled the loss of me and my affection. Be a tree and ignore the puppy until it gives up on biting. Restore attention when the puppy behaves properly. If a behavior equals the opposite of what you want and is never rewarding, it extinguishes itself pretty quickly! There’s nothing more exciting than having a new puppy in your home. While they’re a joy to have, they can also be hard to handle. This is especially the case when it comes to aggressive puppy biting. While it’s play-biting and nipping are a natural behavior, it needs to be reinforced before those puppy teeth turn into adult teeth. These are some tips you can use to stop puppy biting. Remember, puppy mouthing, nipping and biting may be instinctual, but it should never be tolerated or rewarded! If you nip this in the bud early you will have a social dog that has learned bite inhibition and how to control himself! Many new dog owners make a crucial mistake during this stage of their puppy’s development. AVOIDANCE – Even though it makes sense to avoid the little piranha when he turns in to a land shark, ignoring him and his nipping problem will just make things worse. Ensuring adequate and healthy playtime is a big part of raising a well-rounded dog. Some types of puppy games are good for physical development, whereas others are important for mental and social development. Let’s talk about play time and ways to teach puppy what is appropriate to bite and what is not. There are two main reasons why puppies bite. Because 1) they’re teething and 2) because they’re trying to engage with you. If your puppy is teething, you’ll definitely want to make sure they have regular access to lots of safe chew toys of different textures and sizes. It is going to take a few weeks to really resolve puppy biting and, as you probably know (since you’ve read this far) that puppies can be really nippy until they’re about five months old, or even longer if the play biting goes unchecked. You must commit to being very patient with him. 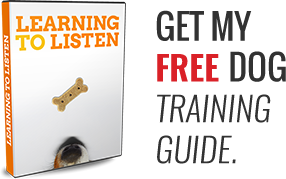 Right now, you and your puppy don’t have really good communication and every interaction you have with your puppy needs to be focused on building that communication. Addressing his biting is one of the best opportunities to do that in addition to the exercises I’m about to cover below. 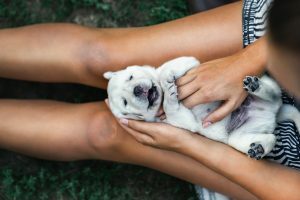 Desensitizing Touch: As soon as you bring your pup home, make sure you have a strong focus on desensitizing your puppy being touched by you and others. Touch his paws – tickle them, massage his ears, neck, face, legs, back, belly, etc. The more he’s used to this, the less likely he is to nip at you. Do not fall for the gimmicks of old school “bite your dog back” some dog trainers recommend. Those are silly and not to mention cruel ways to teach a puppy. If your puppy acts like a starving piranha, then chances are you’ve likely got a high-energy pup on your hands. And if that’s the case, then Exercise early in the morning and throughout the day is mandatory if you want relief sooner rather than later. You’re probably getting pretty good at predicting when your puppy is about to start biting – Fast success comes when you’re one step ahead of your new dog. You need to get good at using a toy to curb puppy biting. 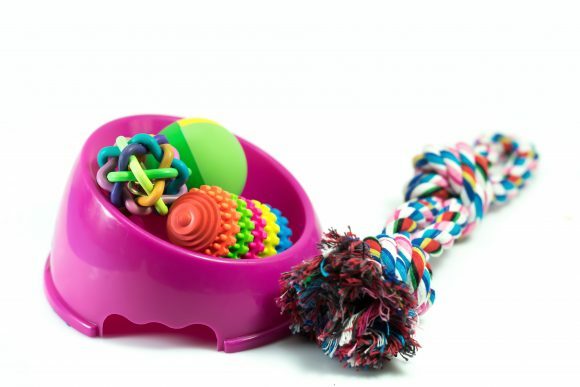 Since you know your puppy is likely to bite you when you go to greet him, you want to be one step ahead of him by having a toy that you know he already likes with you. He likes the toy so much – he goes after that and you are letting him know this is okay for him to bite and my human skin is not, so you want to continually divert your puppy’s attention to the toy – that’s acceptable to bite – over time your puppy is going to start to realize ‘okay that’s something I’m allowed to bite and some other things, your human skin, I’m not’. Puppies are not born knowing this, so you have to take the time to teach him. It’s not reasonable to expect your puppy to just be mellow all the time. Your goal should be to get him to release energy and play when we ask them to, rather than waiting for him to act out on his own. Do You Know Puppies Need To Be Taught Manners In A Certain Order? Enroll in our puppy training program and learn exactly what new lessons puppies need to learn during weeks 12-48. 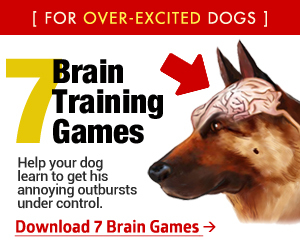 Because getting this wrong hurts your dog. So now let’s talk about how to use treats to curb puppy biting. Your puppy has to know the proper conduct when encountering a person. Remember when your puppy is biting you like a savage beast, he is just trying to engage you. You have to teach him that you prefer a different kind of engagement, something less blood thirsty and a little more civilized. Since you know that Rover is very likely to start biting you when you engage him, you’ve got to be one step ahead so you’ve got a treat ready. Assuming you’ve done some basic training with him and he knows how to sit; you’re going to encourage him to sit for a treat. 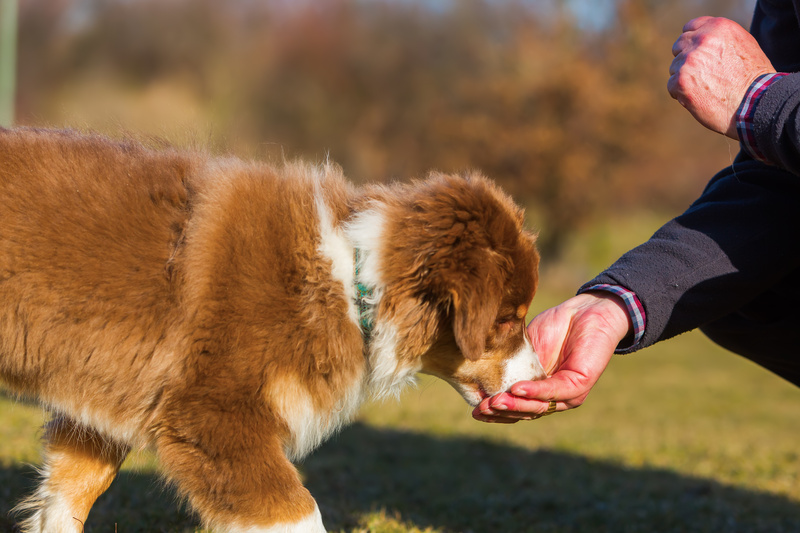 It’s worth noting that many puppy biters don’t take treats nicely so you can also work on gently taking the treat too, simply present the treat with an open palm. When your puppy is in “food mode” he is less likely to bite. 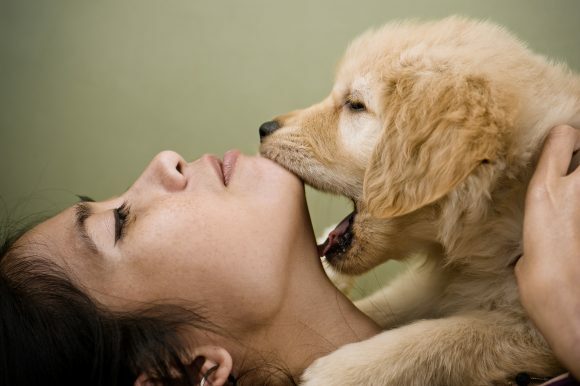 When a puppy is in the mood to eat, they tend to be less bitey. So when you are training like this you’re satisfying his urge to want to interact with you and your desire to have a well-behaved dog at the same time. Initiating 30 second to two-minute training sessions like this teaches your dog to respond to you, rather than being impulsive. This is why it’s so important to make a great effort to understand why your dog is acting a certain way rather than simply focusing on correcting unwanted behaviors after they occur. When you use these approaches that we’ve gone over, and use them often you’ll notice instances of licking where your puppy used to bite. And you’ll know you’re on the right track as this becomes more frequent! Puppy biting can take anywhere between a couple of days and a couple of months with extreme biters so it’s important to keep your expectations in line. So what do you do if you’re just hanging out and you’re caught off guard by the puppy play biting? #1 promptly initiate one of the training sessions mentioned above. #2 Exercise your puppy or place it in a boring place like its crate for a few minutes until it has calmed down a bit. Remember: your puppy can’t train himself, and if he doesn’t learn how to get along in the world as a youngster, he may grow into a difficult-to-manage adult dog who isn’t pleasant to be around. Shelters and rescues are full of dogs with aggression and other behavior problems that show up later in life, but stem from unaddressed issues that began during puppyhood. You want to prevent your precious pup from becoming another statistic. Stop I’m Going To Bite You! Is Puppy Nipping & Biting Ok?